My usage meter currently shows I have used 46% (23GB). Looking at my service usage page shows my current total peak downloads are only 15,713.38 MB. Now, if you add in my current total peak uploads of 7,288.45 MB you get 23GB. So it looks like the usage meter is currently counting uploads against my quota which is not as my contract states. Exetel usage meter measures the total usage during peak and off peak separately . However the total usage will be the sum of the uploads and downloads. This is wrong. My contract has a 50GB peak download quota. Uploads are not counted towards my quota. The usage meter currently says I have used 23GB of my quota when I have only used 15GB of my download quota. dsc68 wrote: This is wrong. My contract has a 50GB peak download quota. Uploads are not counted towards my quota. The usage meter currently says I have used 23GB of my quota when I have only used 15GB of my download quota. This used to be the case but with the new plans, this is not anymore and both uploads and downloads are calculated together so you basically have 100GB of usage quota and not just download quota. angelos wrote: This used to be the case but with the new plans, this is not anymore and both uploads and downloads are calculated together so you basically have 100GB of usage quota and not just download quota. I did not sign up to a plan with uploads included in the quota. I have not been advised of any changes to my current contract. The details of my plan as displayed on Exetel's website clearly states that there is a 50GB peak download allowance. 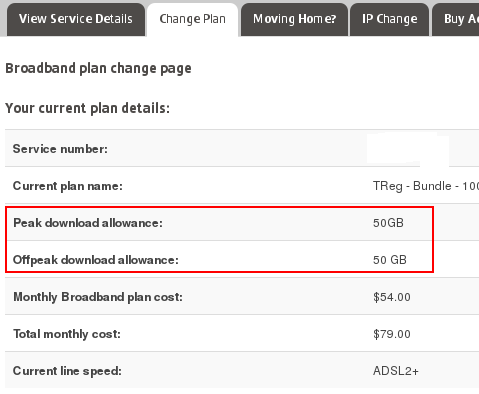 All of the other plans offered on the Change Plan web page clearly state that it is a download allowance. There is no mention anywhere on that page that states that uploads are included in the quota. We will have our Sales team look into this and let you know. The inclusions of the Data allowance is included in the critical summary link which was available at the time the plan change was placed via the Members Portal. Mandy wrote: The inclusions of the Data allowance is included in the critical summary link which was available at the time the plan change was placed via the Members Portal. There is no link to the Critical Information Summary from the Change Plan web page. The only way an existing customer could access the Critical Information Summary when changing plans would be to apply for a new connection from the Exetel home page outside of the existing customer service MyExetel area. In summary, all information that Exetel provided to me regarding the new plan either directly stated that there was only a download allowance or did not mention that uploads were included in any data allowance. 3. Click on " change plan"
5. Once the tick boxes are completed and when you click "apply"
Please refer to the attachment given below. The screen grab you show demonstrates just how misleading Exetel's web site is. It clearly states that the download allowance is 1TB. It is only if you read the Critical Information Summary that it says that the allowance includes uploads as well as downloads. This critical information is only given after the customer has made the decision to apply for the plan. Any customer would be reasonable to assume that the terms offered on every web page leading up to the final confirmation were an accurate representation of the contract offer. To suddenly change to contract terms at the last minute, after the customer has made their decision based on information provided by Exetel that Exetel knows is incorrect is nothing short of fraud. I agree dsc68. Nowhere on the "Change Plan" page does it say that the plan being applied for will meter uploads in addition to downloads. Nowhere in the "Acceptable use policy" document, or the "Terms & conditions" document, or the "Customer service guarantee waiver" document does it mention the fact that uploads will be metered. This is a specific and important piece of information that should be provided up front, before a user has chosen to apply for the plan. To show how misleading this whole situation is, when changing my plan I do not see any mention of upload metering in the plan summary. And when I agree to the "Accessible Use Policy, the "Terms & Conditions" and the "Customer service guarantee waiver", these documents do not indicate my agreement with upload metering... because upload metering has not been mentioned anywhere up to this point. but again fail to make any mention of the important upload metering. I have only just noticed an unusual spike in my ADSL data usage... partially expected (cos I downloaded something) and partially unexpected (cos I was not aware of upload metering). I am going to exceed my data allowance this month for the first time in a long time... and I hope that Exetel is willing to be fair and waive the excess data fee on this occasion. I will be contacting the Telecommunications Industry Ombudsman to lodge a complaint if you are not willing to entertain this. I have just changed my plan now to ovoid this situation from occurring again in the future, and can see first hand how poorly this change of plan process appears to the end user. With regard to the upload and download plan allowance, this is clearly stated on the members area on the plan change confirmation page before the plan change is submitted. However, we do appreciate your valuable feedback and hope to make necessary improvements you have suggested. Your concerns and feedback have been forwarded to our management . In the meantime one of my colleagues will call you to further discuss your concerns with regard to your account. Thanks for the call yesterday to clarify my situation and to take on board my comments. I am pleased to hear you are taking this issue seriously and I look forward seeing the outcomes (next time I use the Member's Portal to change my plan! ).